Cześć! 皆さん、今日は！= Minasan Konnichiwa!, Hello everyone! This lesson is for my lovely blog student + Twitter follower, D-san from Poland! *How to make excuses using せいで ( = seide), のために ( = no tame ni) or から ( = kara) etc. Is it going to be a long lesson? We’ll see. Let’s start! さあ始めましょう！= Saa hajimemashou! Let’s get started!!! First, how do we say “an excuse” in Japanese? = Iiwake bakari shinai de kudasai. = Please stop making excuses! 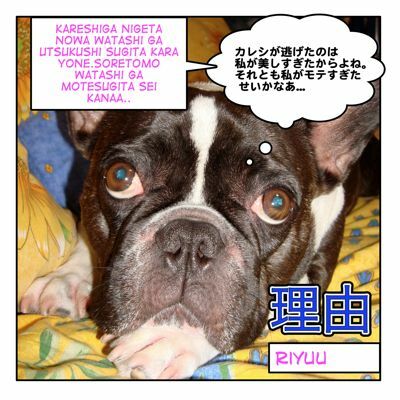 ☆How to excuse or give a reason in Japanese. = Juutai no sei de chikoku shita. = Maggieno sei de koronda. = Sutono sei de hikouki ga kyanseru ni natta. = My flight was cancelled because of the strike. = Boku ga atama ga warui no wa otousan no sei dayo! = I am stupid because of my dad. / It’s my dad’s fault that I am stupid. = Kore wa anata no sei desu! = This is your fault! Do you want stronger language? Try the following! = Minna Anta no sei da! = Everything is your fault. = Omae no sei da! = Mousho no okage de yasai ga takaku natta. = Because of the heat wave, the price of vegetables has gone up. = Kaze wo hiita okage de ichinichi neteru hame ni natta. = Because I caught a cold, I ended up staying in bed all day long. Note : You can switch お陰で ( = okage de) and せいで ( = seide) in the above examples. Note : Remember 〜のお陰で ( = ~ no okage de) can be used for grateful feelings as well. = Maggie sensei no okage de nihongo ga jouzu ni natta. = Thanks to Maggie, my Japanese has improved. = Okage sama de sukkari yoku narimashita. = Thanks to you/God, I feel much better now. = I was late because of the traffic. = Kaze de kurasu wo yasumimashita. = Because I had cold, I skipped the class. Compare to 1) & 2) there is no emotional blaming here. Just implying inevitable factual cause. The same thing here with a verb. = Amega futta node kyouwa sakka no renshuu wa arimasen. = Because it rained today, there is no soccer practice. = Isogashikatta node shukudai ga dekimasen deshita. = I was busy so I couldn’t do the homework. = Kyou wa atama ga itai node kurasu wo yasumimasu. = I have a headache so I will skip class today. = Kinou atama ga itakatta node kurasu wo yasumimashita. = Because I had a headache I skipped class yesterday. = Atama ga warui node wakarimasen. = I don’t understand because I am stupid. Note: Usually we give the reason for something, and then continue on with the sentence and explain the result. However, sometimes — as I wrote in my ちょっと＋ 曖昧 = Chotto& Aimai lesson — we don’t finish the sentence because the result is negative. So if a sentence is unfinished we can safely assume the result is negative. = How come you are late? are used to explain the reason as well. = Yarukoto ga nakatta kara saki ni kaetta. = Because there was nothing to do, I left earlier. = Ima isogashii kara dekimasen. = I am busy now so I can’t do it. = Ima isogashii node dekimasen. Which one do you think is more polite? They mean the same but Ex. 2) sounds more polite and mature because から ( = kara )is for subjective reason and could be emotional while ので ( = node) is more objective and sounds logical cause sounds inevitable. = Okane motte inai kara kaemasen. = I don’t have money with me, so I can’t buy it. = Since I don’t have money with me, I can’t buy it. Ex.2) with ので ( = node) sounds more polite and mature because it is more factual reason. = Taifuu no tame kyou wa subete no kurasu wa kyuukou desu. = Due to typhoon, all the classes are canceled today. ＝Ame no tame basu ga okureta. = Because of rain, the bus came late. In this case, 雨の為に ( = Ame no tameni) is just a statement and sounds flat or formal while せいで ( = seide) and お陰で ( = okagede) involves more feelings. = Kodomo ga byouki no tame kyou wa hayabiki wo sasete kudasai. = Since my child is sick, please let me leave earlier today. Actually so many Japanese students will translate “because” into 何故ならば（ =nazenaraba） in English class. For example, your brother saw you eat his snack. = Doushite watashi no okasi wo tabeta no? =Naze naraba onakaga suite ita kara desu. But NOBODY says that in conversation. In casual conversation, we use だって ( = datte) ＋もん ( = mon) or もの ( = mono) between family or friends. = Datte onakaga suite(i)tan damon. = Datte anata no koto sukinan da mono. Let’s look at a more formal situation. =Doushite sono kabu wo katta no desu ka? =Why did you buy the stock? = Naze naraba sono kaisha ga rieki wo kanari dashite iruto kiita kara desu. It’s fine to use 何故ならば ( = nazenaraba) in this situation because it is formal. There are people who might say this and we actually hear this kind of line not just in TV dramas but also in formal situations in real life. We also use というのは ( = to iu no wa) when we explain the reason. It is not necessary to use this if someone asks you a reason for something. We use it when we explain our own actions. = toiu nowa+ reason+ kara desu. = Sakujitsu ei sha no kabu wo kaimashita. To ii masu no wa sono kaisha ga rieki wo kanari dashite iruto kiita kara desu. = I bought stock in Company “A”. It is because I heard that company has been making a lot of profit. = I wonder how come he is so mean to me? = Sore wa anata /kimi ga suki dakara dayo. = That’s because he likes you. = (t)te iu nowa+reason+kara/mon and etc. = Mou ano mise ni wa ikanai! Tte iu nowa chotto kono aida asoko de mometa kara nan da. = I’m not going to go back to the store (restaurant, bar..). ‘Cause I had some fight (trouble) there the other day. = Isha kara tabako wo chuui saremashita. Dakara mou nishuukan mo sutte inain (or no) desu. = Doctor warned me not to smoke. That’s why I haven’t smoked for two whole weeks. = Kare wakaretan datte. Dakara ima ga chansu nanda. = I heard he broke up (with her). So I have a good chance now! = Doushite kare to wakareta no? = How come you broke up with him? = Dakara mou issho ni ite mo tanoshiku nakatta kara datte(itteru desho)! = (I told you already) ‘Cause it was no longer fun to be with him! = Dakara anata to kaimono ni iku nowa iya nano! = That is why I don’t want to go shopping with you! OK, now it is your turn! Try to explain the reasons or make excuses, OK? When someone ask you for a reason, we don’t always use causative particles. But try to use some for your practice. Answer is not just one. If you want me to correct your sentences, just leave them in the comment section below. = Doushite kinou konakatta no? = How come you didn’t come yesterday? Because you had a date. = Ashita tokoka ni doraibu shinai? = Do you wanna go for a drive tomorrow? No! Because you are busy. = Boku no keitai (no naka) doushite mita no? = Why did you look to see what was in my cell phone? You can’t explain why exactly but you felt uneasy. = How come you don’t play with me? Because you have been busy with exams lately. = Datte saikin shiken de isogashiin da mon/mono. = Doushite chikoku shitan desu ka? =How come you were late? = Juutai no tame chikoku shimashita. Because you don’t know your schedule yet. =Mada sukejuuru ga wakaranai monode..
= Kono aida kashita okane mada kaeshite moratte nain dakedo. =You haven’t returned the money I loaned you the other day yet. Because you haven’t got paid yet. =Mada kyuuryou ga dete inai node (kaesemasen (deshita)). = Mada kyuuryou ga dete inai tame kaesemasen (deshita). = Mada kyuuryou ga dete inai kara… (kaesenai). = Kono aida tanonda ken dounarimashita ka? = What happened to the matter I asked you about the other day? You haven’t done it yet because you are still waiting for the client’s answer. = Doushita no? Kaoiro ga warui kedo. = What’s wrong? You look pale. You drank too much last night. = I drank too much yesterday. = Kyou kuruma de konakatta no? =You didn’t come by car today? Because your brother took the car when you were asleep. = Nete iru aida ni aniki ga saki ni (kuruma ni) nottechatta kara saa..
= Doushite sonna koto wo shitano? =Why did you do such a thing! = Anata/anta/kimi/omae no sei da/desu! = Doushite maggie ga sukija nai no? = How come you don’t like Maggie? There is no good excuse! = Doushite sonnani Maggie no koto ga suki nano? = How come you like Maggie so much? = Kaesu kotoba mo arimasen. = You are quite right. = Kono saito ni mainichi konai iiwake wa nanimo uketsukemasen kara. I won’t allow ANY EXCUSES for not coming to visit this site everyday! I don’t really understand why they use 「であった」here just before ため. I’d also asked on a different post why a sentence had left out the particle に after よう and I’m wondering if the same thing applies here — you can leave out the に after ため and it still holds the same meaning. であった implies here the past tense (=the house was). ため implies the reason (=therefore). It was a very solid house. Therefore it took a long time to build it (lit. before it was built). And yes, the に part. in ために emphasizes the meaning and sounds more polite. There is a rule in Japanese. The longer the sentence, the more polite it is. Thank you for helping ＠Forest! You can either use the following patterns. you can also use follow pattern: ～（という）理由は～（だ）からです in order to describe / show the reason, why something is like it is. First, does スズメバチ　really just mean “wasp” or couldn’t it also mean “hornet”? Second, she says that this “ため” cannot ever be exchanged with “から”. I did not quite understand why. Since the sentence is from a newspaper, から surely is to casual for that occasion, but if used in a normal conversation, would から still be totally wrong? 2. The difference between から　and ので – we agree that node is more polite and objective. I learned from other sites, that から　emphasizes the reason and indicates, that the given reason is the only reason (this and only this is why…), while ので emphasizes the result and states just one reason among possible others. My teacher could not confirm this, so whats your opinon about that? 3. Concerning sentences like: お金もっていないから買えません。　I found this site that says, you cannot use から in sentences like this, because Japanese people would never talk like that. http://www.learn-japanese-adventure.com/te-form-cause-reason.html According to this site, you have to use the te-form if the result is a state or a potential form. However, you use から all the time under exactly those conditions, so I’m quite puzzled who is right. 4. Another lesson on that site says, that noun + で can only be used if the result is inevitable. So 雨天でびしょぬれになった。 would be correct, while 雨天で一晩中古い映画を見ました。 would be wrong, because that would be a choice. Do you agree with that? Hi, Thank you for spotting the typo as always. I fixed it. 1. スズメバチ means either “wasp” or “hornet”. I agree the most to the information you wrote but at the same time, there are cases you just switch から with ので to add the politeness. 3. Actually we do talk like that in conversation. The action, watching old movies all night long is not caused by the rainy weather. It was your choice. 5. As I mentioned in the lesson, we do use なぜなら in literal form　and it is not so common to use it in conversation. OK, in a movie or drama, you may hear that. It sounds too dramatic to use in daily conversation. I think you should talk to your Japanese teacher to discuss the 1 and 2 questions more. Please be nice to her. And ask the site owner about No. 3, 4. I can try to answer questions if it is something from my site but I am not so comfortable answering for other sites. They are all great and they know much more than I. Nice try! OK, I will correct you a little. (Remember あいつ is for male speech and it sounds a bit rough. If you use あいつ, いい奴（やつ）だから is more adequate than 人. →??? 一つの恋だから？　Can you rephrase it? That’s because Kamekun is my only love. “neteru hame ni natta” is correct. I must have thought “Um…this sentence is too difficult. I should change it to 寝ていた=neteita. ” and just forgot about fixing the text. Thank you so much for your nice comment and letting me know your interests. It is very important for me to know what you are interested in. I think studying Japanese from many different sources is a good idea. We don’t always talk formal Japanese which you learn in a textbook (we skip particles, we don’t finish the sentence properly,etc.) and at the same time we don’t always talk like manga characters either. Kansaiben is so much fun to learn. If there is a chance, I would like to make a lesson,too. Maggie sensei, I have a question about this sentence. =Kaze wo hiita okage de ichinichi nete ita. I notice the difference between the romanji and the actual sentence. Which one should I follow? thank you for all your wonderful lessons. I have no idea what level I’m in, but I can read all hiragana and katakana and a couple hundreds of Kanji. Not a lot though. My problems are forming sentences especially complex sentences and having no clue which words to use in a sentence. I would also love to be able to read comics with ease, but the problem is when I study Japanese in regular books, they don’t tell me what real Japanese speak. So your website is truly a gem for me because you make it so fun to learn Japanese. My goal is to learn a lot of Kanji, to know a lot of useful expressions and slangs (especially in maga^^), to be able to understand complex sentences, to learn Kansai-ben too because a lot of entertainment people on TV shows seem to speak that way.